Later this year, voters will go to the polls to elect their president. Thanks to Senator Gerard Craughwell and the Opposition leader, Mary Lou McDonald, the political establishment has failed in its bid to prevent the Irish people from doing this. Interestingly though, the media establishment now appears intent on savaging anyone who dares to put themselves forward, while continuing to treat Michael D Higgins with the same supine deference it has always shown him. It appears as if Official Ireland simply cannot stand the thought of President Higgins being challenged, least of all by a person who has the audacity to make money and generate wealth, as the businessman Gavin Duffy has found to his cost. Every facet of the ‘Dragons’ Den’ star’s career has been raked over in recent days. We have learned that Duffy provided public relations services to the then-Fine Gael leader Enda Kenny. This is hardly news: Duffy runs his own communications firm and has provided similar training to many politicians. He is also clearly not a Fine Gael candidate or proxy candidate. Nor indeed is he a Fianna Fáil candidate, although you could be forgiven for thinking otherwise given the tone of some recent reportage. “Presidential hopeful’s links with FF TD only revealed after questioning,” an Irish Independent headline blared last Saturday. As with Kenny, Duffy’s company has provided communication services to the Fianna Fáil TD for Louth Declan Breathnach. Once more, a mundane fact has been made to appear newsworthy. Politicians of all stripes frequently seek professional assistance to help them become the consummate media performers they need to be. Companies such as Gavin Duffy & Associates provide these services for a fee. The Irish Independent headline in this case appears to suggest that Duffy was in some way wrong not to release details of his professional relationship with Breathnach, it spite of it having nothing to do with the presidential race. Should he also have to “reveal” the names of every client his company has had? The Irish Independent also reported that “Gavin Duffy offloaded property portfolio to settle loans from string of purchases”. Nothing untoward is suggested in the article, but combined with the other news reports, the picture being painted of him is not a positive one. It isn’t just one newspaper, either, as a sample of recent headlines shows. 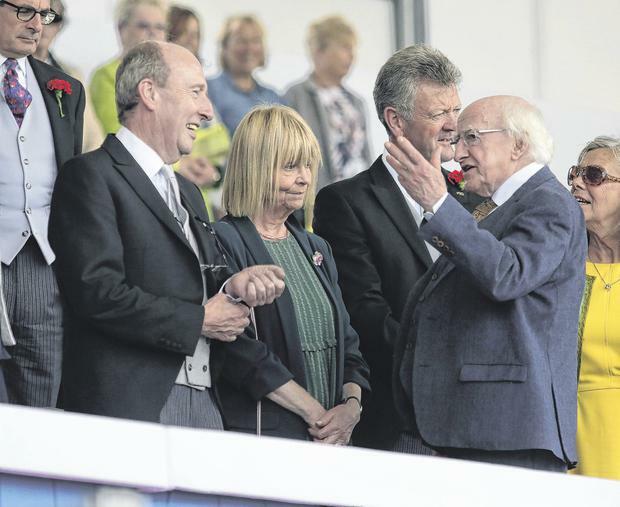 “Áras hopeful advised O’Brien on Moriarty fallout”, ‘The Sunday Business Post’ reports. “I won’t take a pay cut like Michael D did, says Duffy” – ‘The Irish Daily Mail’ tells us. Do you spot a pattern emerging? The Irish media have taken a sudden and very strong dislike to Gavin Duffy. The Dragon-come-villain can take some comfort in the knowledge that he is not alone. In the week that the possible candidacy of Éamon Ó Cuív has been much-discussed, the likeable FF stalwart also had to endure harsh criticism in ‘The Sunday Independent’ from the columnist Eilis O’Hanlon. After taking Ó Cuív to task for a range of perceived flaws, O’Hanlon zeroed in on the main area where he falls down in the eyes of media opinion shapers. “There’s…the question of whether a pro-life advocate can really be a serious candidate for president in the same year that over 66pc of the electorate voted to liberalise abortion laws,” she wrote. Writing in the same edition, the Independent News & Media political editor Kevin Doyle poured cold water over Senator Joan Freeman’s candidacy for much the same reason. Note the wording. Not the losing side: the wrong side. Perhaps we are being unfair to the aforementioned journalists. The presidency is no small thing, and those seeking the office should be scrutinised. If Duffy and the other candidates wish to place themselves before the people as presidential candidates, then they need to expect hard questions. There is just one problem. When was Higgins ever asked a hard question? Why are his prospective opponents being subjected to a level of scrutiny which he completely evaded in 2011, and which he has not had to contend with since then? Higgins might be the best candidate to be Head of State for the next seven years – he is certainly considered as such by the majority of Ireland’s media. But if he intends to be president until late 2025, he too should be properly vetted. – President Higgins, given that you repeatedly told voters in 2011 that you would only serve one term, aren’t you guilty of wilfully deceiving the Irish people? – You recently called for a ban on gambling ads. Do you intend to exceed the limits of your office by calling for more legislation in future, and if so, what will you be proposing? – During the General Election in 2016, you publicly criticised those who proposed to lower taxes. Will you be participating in the next general election also? – Throughout your time in office, you have repeatedly criticised capitalism as an economic system. Given that you have spent your entire career in the public sector, should you not be more cognisant of the efforts of those business people whose taxes have allowed you to function in your various well-paid roles? – In 2016, you responded to the death of the Cuban dictator Fidel Castro by referring to him as a “giant among global leaders”. At the time you said this, were you not aware that Castro had killed or tortured thousands of his own people, or did you know and simply not care? – In 2013, you said that the deceased Venezuelan socialist leader Hugo Chavez had “achieved a great deal during his term in office, particularly in the area of social development and poverty reduction”. Do you still think that this is true, given that inflation in Venezuela is on course to reach one million percent, and that the people there are experiencing serious shortages of food, medicine, fuel and electricity? – In the last month, the Nicaraguan ruler Daniel Ortega has defended his use of paramilitary violence against protesters. Violence over recent months has left more than 300 people dead, according to CNN. Given what Ortega has done to his own people, do you regret vocally supporting him and welcoming him to your family home when he visited Ireland in 1989? However, I won’t be holding my breath waiting to get answers to these questions.